The weather forecast was pretty close to perfect for last weekend and aside from a little wind on Sunday afternoon, the weatherman got it right for a change. Sadly, there is some wind forecast for this weekend but it doesn’t look like enough to shut things down for more than a couple days. I guess we’ll just have to keep our fingers crossed and take a look at what was biting before the wind blew. 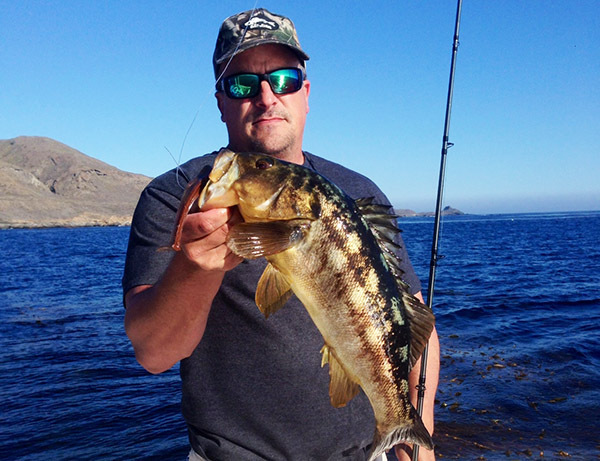 The rockfish bite at the Channel Islands is still going strong and should continue to do so until the season closes on December 31st. It sounds like Santa Rosa is the place to go, but if you’re a private boater I’d wait for a few days of Santa Ana winds to blow before making the run. 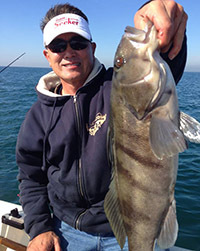 Along the coast, Captain Larry Heron of Calico Hunter Charters has been fishing the beach south of Santa Barbara and has been catching lots of bass and rockfish on swimbaits in shallow water. If you’ve never fished up that way, now is a good time to head up because the commercial lobster buoys are there to show you the spots. Larry’s been getting most of his fish in 40-60 feet of water, so that’s the depth range you’ll want to focus on if you head up. The rockfish are biting in the Santa Monica Bay and Short Banks has been kicking out some impressive reds and lings for at least one boater. Bobby Martinez fished three days in a row up there and ended up with limits of big reds and lings on every trip. On Sunday, the fishing was so good, that he limited out in the first thirty minutes. Live squid has been the hot ticket up there, but the fish will also bite the jigs. With water temps in the low sixties, the bass bite is still going strong at the islands. I made the run out to San Clemente Island on Sunday with Matt and our friend John Curry on his 20-foot Robalo center console. We fished the east end back side of the island and the bass bit full speed wherever we found current running into sparse kelp. We ended the day with around a hundred fish up to five pounds on the 7” MC Weedless Swimbait and the MC Slug. If you’re planning on running to the island, check the website at www.scisland.org to make sure the island will be open. But don’t assume the island is closed just because the map is red. If you click on a closed section, it will tell you the time that section is closed. The map was completely red the day we went, but the closures ended at 2 AM and didn’t start again until 3 PM, which gave us all day to fish the island. 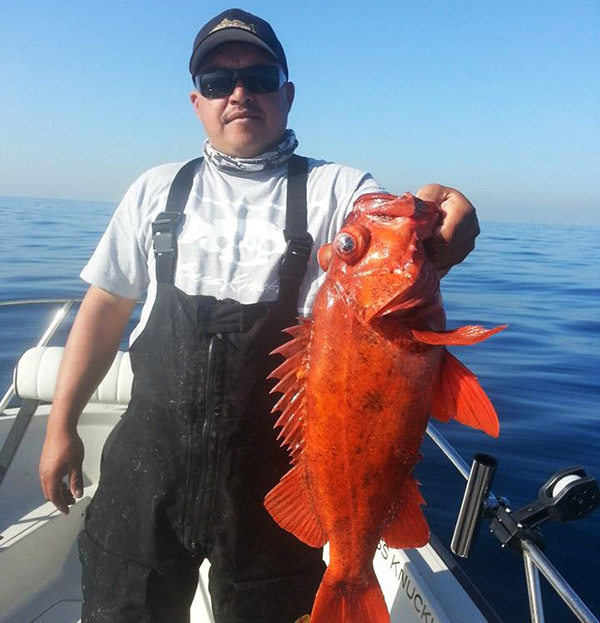 There are plenty of rockfish to be caught in the Long Beach area, including the big reds that the sport boats have been catching out at the 150 area. But closer to shore there is a good bass bite going on as well. Tommy Nitihara and John Beerling fished the artificial reefs on Sunday and ended up with thirty mixed sand bass and calicos. There were some big fish in the mix and their biggest five would have gone about twenty-five pounds. All of these fish are coming on swimbaits fished close to the structure. And just like up north, there are lobster buoys on most of the spots, so it’s a great time to go prospecting. Chris Lillis and Brian Marshall took advantage of Tuesday’s weather to do a couple of trips. They spent the morning fishing spotted bay bass in Newport Harbor and followed that up with a nighttime trip to the Long Beach Breakwall. 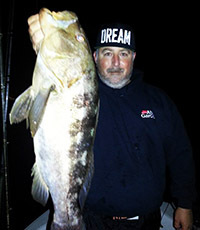 Brian ended up adding another monster calico to the tally of giant bass he’s caught at the wall and although I didn’t speak with him, I’d bet my bottom dollar it came on a Pearl Bug fished high and tight on the wall. 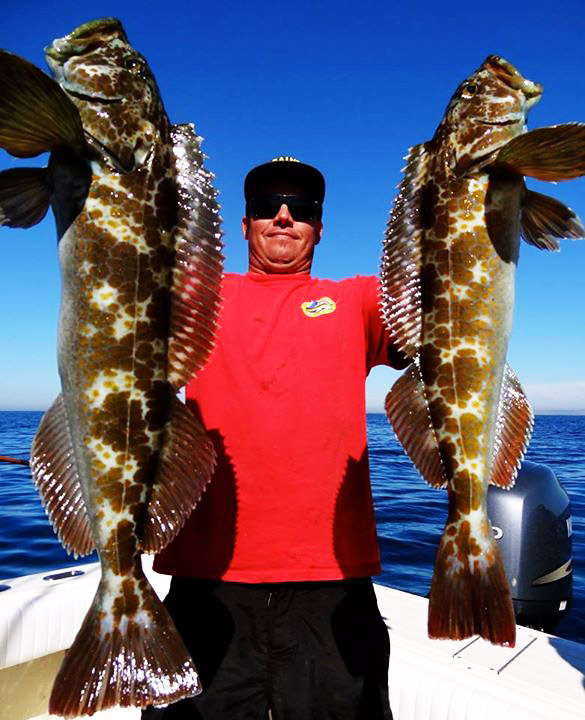 Down in San Diego, Captain Duane Mellor of Seasons Sportfishing continues to absolutely lay waste to the big reds and lingcod on his ¾ day trips. They have some open party trips coming up, so look them up if you’re interested in getting in on the action. 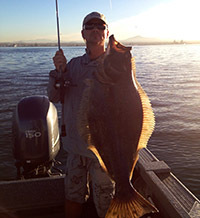 For those looking for a change of pace, there are plenty of spotted bay bass and a few halibut biting in the San Diego Bay. Matt went down there on Friday to fly fish for spotties with his buddy Eric Noguchi and while they only managed a few bass on the fly, Matt caught a personal best 25 pound halibut on a swimbait. The amazing part of the story was that he caught it on six-pound mono and lacking a net or gaff; Eric managed to grab it in the gills and lift it into the boat without breaking the line.